The first product, Coco Lite Pop Cakes, are vegan, super light and airy, have almost no calories and are a bit wider than a burger bun. My Whole Foods store carried them in 4 flavors: whole wheat, multigrain, maui onion and blueberry cinnamon. Apparently, they are made right there in the store in a machine similar looking to a cotton candy machine and when those cakes are popping out, it’s quite entertaining to watch (according to the cashier). I’ll have to go back for the show but I bought all 4 flavors for tasting—they are all mildly different. If you’ve never seen these, they are really a food about nothing—like crunchy air— but they are the great vehicle on which you can put everything! I used the multigrain as my raft and floated it on a simple salad. I spread some Trader Joe’s Salsa Verde (green salsa) on top. 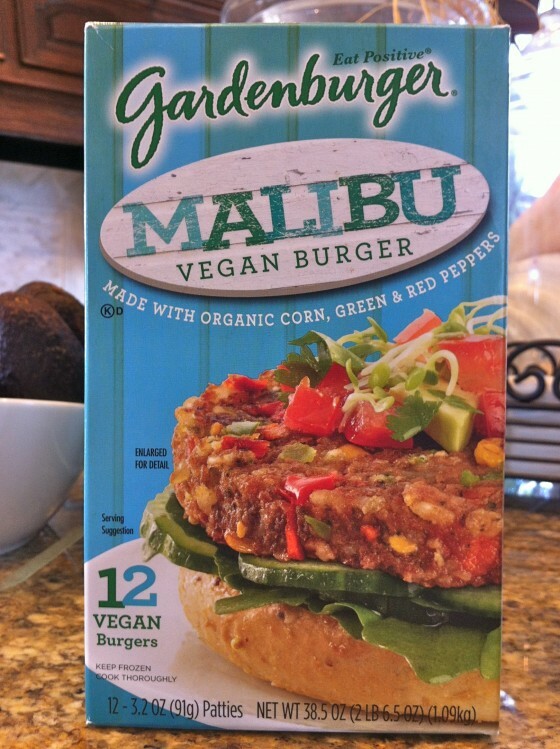 The second product—Gardenburger Malibu Vegan Burger—was a surprising vegan discovery at my Costco. I’m not sure why they are called “Malibu” except that the packaging is no doubt trying to evoke a beach bungalow feeling. 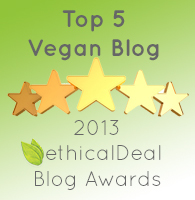 But since I live near Malibu and I am the West Coast viewpoint of Vegan American Princess, how perfect to use these? Los Angeles is definitely obsessed with burgers so these may be a new answer to the vegan burger question! After microwaving one according to the directions, I stacked it on the Coco Lite Pop Cake and spread some guacamole on top. I added some tomatoes and garnished with cilantro and it was delicious, vegan and so simple. On the back of the box of the burgers, an interesting recipe for Spicy Mango Stir-Fry looks like a good way to use strips made from the burgers. I’m definitely going to try this one. 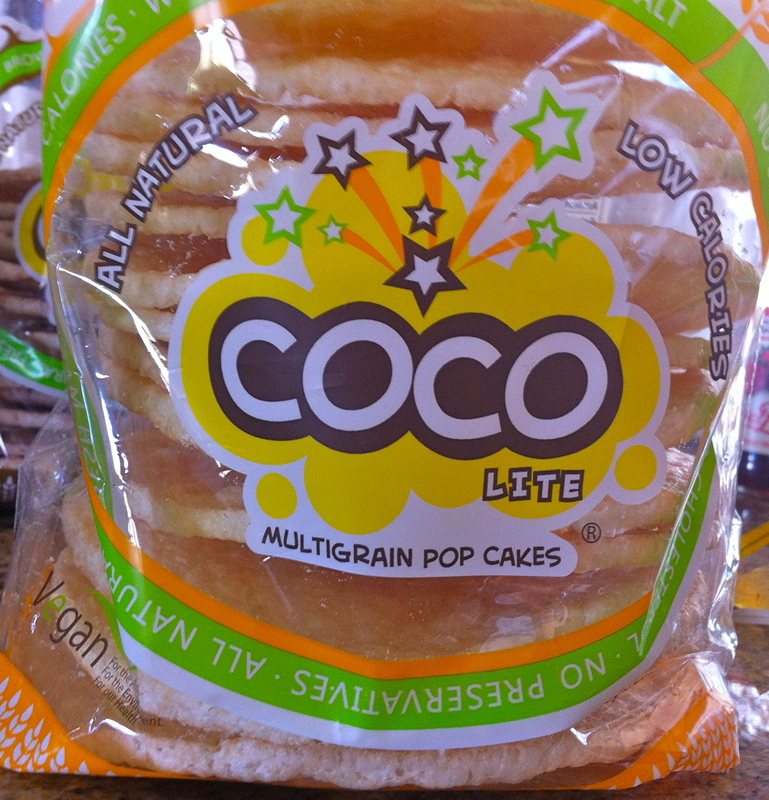 An East Coast product that is similar to Coco Lite Pop Cakes are Magic Pop Cakes. My mom on Long Island keeps an inventory of various flavors of these and uses them in so many different ways! Wow thanks for the info. I can’t wait to go and get the burgers. So much easier then making from scratch when we are so busy running around. Keep em coming El. Let me know if you like them! Serve them Jonathan and say you made them! Also, do you know if it is Non-GMO? My Costco doesn’t have them any more either! One of the Whole Foods in my area them and the other doesn’t. If there’s one near you, call them and ask for it. But the company does have a website, http://www.cocofoods.com, and they have online shopping! 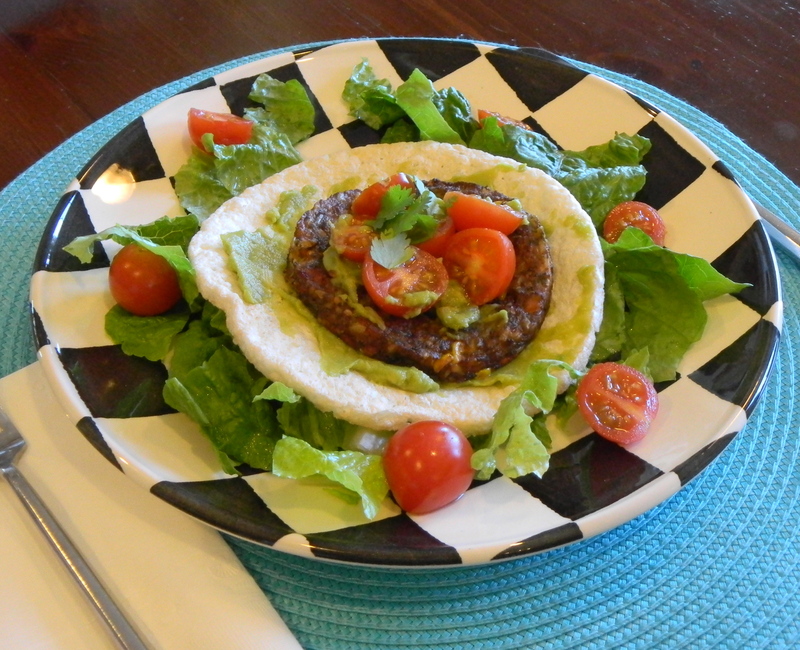 The malibu burgers can be found at Bj’s wholesale clubs and they are all organic. I had tried to find these burgers but to no avail. B.J.’s had discontinued them and Costco where I live never had them. They are also hard to find them in a regular food store. I do really like the taste of them and wanting to buy them; but I can’t find them anywhere!! Hi Bette! Unfortunately, my Costco doesn’t have them currently but I have asked them to get it back into the store! Hopefully that will happen soon! Let us know if you find them! Thanks for reading and commenting! I wish I could find the Coco Lite Pop Cakes in my neck of the woods. My Whole Foods does not carry them. I have a great idea! If they are a food about nothing, maybe we could call them the “Jerry Seinfeld” pops since that was a show about nothing. These products look great and I love a simple meal that I could throw together in minutes!! Always looking for a new veggie burger and now this! If you can’t get Coc Lite, maybe Magic Pop is really similar! Magic Pop is probably similar but they dont have the cool variety of flavors. Oh well! Where can I buy them? My daughter fell in love with these at college and I can’t find them in the store. Any suggestions? Sorry just saw where you said Costco. I will give them a call! Really? Who knew? Thanks for the tip! Thanks—I think you would like it! I hate traditional rice cakes (honestly, who -really- enjoys them?) but I do love popped grain cakes like these! Using them to make an open-faced burger sandwich is so smart. Never would have thought of that! I just had a peanut butter and jelly on a pop cake! I agree with you that traditional rice cakes are just not as good as these! And they’re so big and low calorie! The Malibu burger is truly delicious. Unfortunately, it contains carrageenan, an ingredient banned in infant formula in Europe. There are concerns that they are tumor-producing. I have had to give it up. I would urge everyone concerned about carrageenan, a red seaweed extract with zero nutritive value, to contact Gardenburger about removing it from their products. Hi Irene! I learned about the potential dangers of carrageenan recently. I’ve started making my own almond milk, as I described in my post about carrageenan. Thanks for alerting me to the fact that it’s in these malibu burgers. There are companies that are trying to do away with the use of carrageenan. Hopefully it will become a trend! I love the Malibu Burgers and purchased them at Costco also. I brought them in for lunch and shared with my co-workers. We all are Costco members and have all purchased the Malibu Burgers, but much to our dismay Costco no longer carries them. Can anyone tell me where I can purchase them. I live in Delaware but haven’t seen them in the stores. I would try your local supermarkets, especially the bigger chains which are trending forward in their vegan products. If you have no luck, go on Gardenburger’s website to see retailers. I bought them yesterday at BJs in Oaks, PA – it looked like it was the last carton, however. I see them on Amazon, but I personally don’t have room for a case! Costco stopped selling Malibu Burgers in Boca Raton, FL. BJ’s in Boynton Beach, FL says it is on their inventory but has not shown up in the freezer for two months. Who in Palm Beach County Florida sells Malibu Burgers? Thank you. It’s so hard to keep track of which supermarkets are carrying the many veggie burgers on the market now. I would ask your local market if they could stock them and tell them how awesome they are! WHERE CAN i PURCHASE THE mALIBU VEGGIE BURGER IN THE rICHMOND vA AREA?